0.74 oz. bag. No High Fructose Corn Syrup. 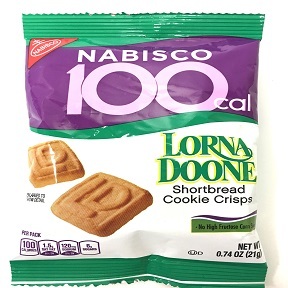 Ingredients: unbleached enriched flour(wheat flour, niacin, reduced iron, thiamine mononitrate (vitamin b1), riboflavin (vitamin b2), folic acid), sugar, palm oil, corn flour, dextrose, salt, baking soda, soy lecithin, cornstarch, natural and artificial flavor. Contains: wheat, soy.